Advanced control of injection-molding machine automation – including the ability to manage six or more high-speed axes of motion both inside and outside mold area – are among the standard capabilities of the new Visual 3 robot control from Sepro Robotique. The Visual 3, which is intended for use with Sepro’s newest S5 Line of three-axis servo robots as well as the Generation 4 (G4) range, is being introduced at PLAST 2012, the European plastics-processing tradeshow being held 8 – 12 May, 2012 in Milan, Italy. Sepro is exhibiting in Pavilion 22 on Stand C26/D28. • “Path Tracking… The robot can be programmed to move a part through a complex pattern inside or outside of the mold space. This makes it possible to remove large complex parts from tight mold openings, or perform motions outside the molding area that might otherwise require an articulated-arm robot: edge-flaming to remove flash, for instance. • Intelligent sensors… provide the option to recognize different grippers with an RFID reader or to use cameras for quality control or positioning of parts. • Digital Vacuum Switch… Now a standard feature on Visual 3, this convenient function allows users to fine-tune the vacuum-flow settings remotely, using the control pendant instead of valves located on the robot. Visual 3 can even manage intelligent peripheral equipment including vision, bar coding and RFID devices. A PC Studio editor/monitor function, which works in a familiar Windows® environment, makes it easy to fine-tune complex programs and store them conveniently for future use. These advanced capabilities, along with a standard I/O module with 23 inputs and 24 outputs (extendable to 96 inputs and 96 outputs), make the Visual 3 the ideal solution for controlling multi-function production cells. 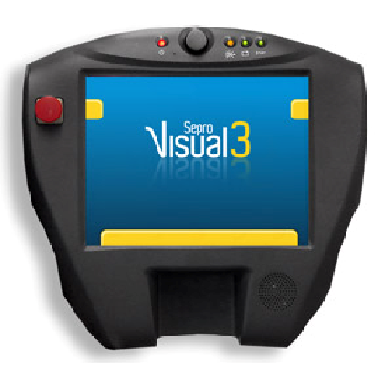 Like the Visual 2, the new control has a large, easy-to-read and -navigate 10-inch touch-sensitive LCD screen that make operation simple and intuitive, while giving uses access to full system documentation. A joystick allows operators to actually steer the robot to fine-tune its movements. A Sepro-patented Simple Pick & Place module steps the operator through the robot programming sequence with a series of easy questions about the application. The results are presented immediately in three-dimensional video. Almost unlimited connectivity means users can upload and download information via Ethernet, USB connection or even Wi-Fi. Founded in 1973 and now headquartered in La Roche-sur-Yon (France), Sepro Robotique was one of the first companies in the world to develop Cartesian beam robots for injection-molding machines, introducing its first CNC controlled “manipulator” in 1981. Today, Sepro is the largest independent seller of Cartesian robots in Europe. Its Italian representative, Sverital, is located in Milan, Italy. Customers around the world are supported by numerous direct sales and service offices as well as independent business partners, distributors and service hubs that extend Sepro’s global network to over 40 other countries. Sepro is the largest robot supplier of the automotive industry in Europe and America, and has equipped more than 22,000 injection-molding machines worldwide.